Eva says the "got to go" list was an anomaly, one of those wacky things that happens once in a blue moon. Yet there have been stories for years of kids pushed out of Moskowitz Academies, for inconvenient behavior, low test scores, whatever. Eva is now demanding public funding for the Moskowitz pre-K but refusing to submit to required oversight by the city. Rules are for the little people, and that would be us, the people who serve all children. If there's an "anomoly," it's the fact that this particular list was placed in writing. @campbell_brown @SuccessCharters @NYCSchools next time they will not make the mistake of leaving a paper trail. Eva's test scores are no miracle. They're a product of the drill and kill method she favors that values test scores over children. How else do you explain children soiling themselves as a matter of course under the abusive leadership she fosters and defends. In a public school, this would be considered child abuse. If you didn't allow a child to go to the bathroom and that child soiled herself, you'd be guilty of corporal punishment under CR A-420. When my dog asks to go out, I jump up and take him. Therefore I treat my dog better than Moskowitz treats the children under her care. 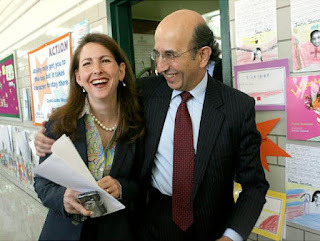 Anyone who tells you Moskowitz is an amazing success story is ignorant, willingly or otherwise. There is no way I'd subject my kid or yours to the ridiculous and joyless discipline inherent in her test factories. There is also no way I'd equate a Moskowitz Academy with "Success." In my view, success entails a certain degree of happiness. Creating compliant drones is great for companies like Walmart which pay poorly for lives of drudgery. Doubtless that's why the Walmart family is all in for charters. Nonetheless I want something much better for the children I serve. That's just one reason I don't work for the likes of Eva. A better reason is I have a better job. I serve all high-needs kids, none of whom will get a great standardized test score, and none of whom would be accepted into a Moskowitz Academy. Despite recent reforminess, I still have better working conditions than Moskowitz teachers ever will. I want my kid and yours to have better working conditions and therefore reject the preposterous claims that we somehow oppose "excellence." If "excellence" entails forcing working people to demonstrate publicly against their own interests, like Eva just forced her teachers to do, who needs it? Moskowitz Academies take public money, but are not public schools. Public schools serve the public, and do not discriminate against ELLs or kids with disabilities. They don't write "got to go" lists about kids whose scores will hurt the bottom line. The stakes attached to scores are there because Eva and her BFFs are waging war against us, the last bastion of unionism in these Unitied States. It's an important war, because if we really cared about "excellence," we'd want our kids to have excellent lives, as opposed to excellent test scores. Hobbling union deprives our children of opportunity and makes it more likely they'll spend years of drudgery in service of Eva's BFF the Walmart family. Moskowitz is a demagogue and I applaud NY Times reporter Kate Taylor for shedding further light on her misleading and unethical practices.